Chantez Plus Fort! is available in two editions: KS2 or KS3. The only difference is the cover (to enable matching with other books from the same series), the contents are the same. Chantez Plus Fort! is a photocopiable book and audio CD pack containing 20 easy-to-learn French songs written specifically to help children to learn French. The songs are linked to the QCA schemes of work for modern foreign languages at Key Stage 2 and are also suitable for Key Stage 3 beginners. 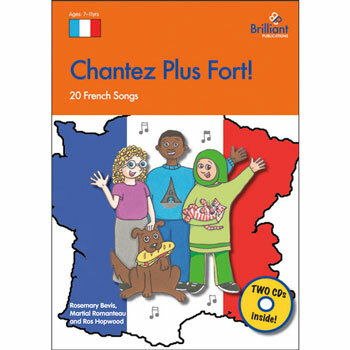 The audio CDs contain all 20 songs sung by French children, instrumental tracks for the 16 original songs and mini-dialogues which can be used for listening comprehension and role-plays. The accompanying book contains teachers' notes with ideas on how to introduce, use and extend the songs, photocopiable illustrated song sheets, photocopiable music sheets including guitar chords, scripts for the mini dialogues, and English translations of all the songs. Chantez Plus Fort! has been developed for use with children aged 7 - 14 years (Key Stage 2 and Key Stage 3) who are beginners to the French language. CDs are included so no music reading is required. Click on the image below to download a sample page from Chantez Plus Fort. A lovely book, with some great songs for reinforcing vocabulary - just a bit of a shame there are no photocopiable worksheets or flashcards to go with it. 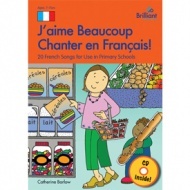 having used all the songs with my class in "J'aime chanter" I bought this one. 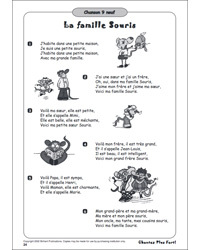 There are some nice songs in the book, suitable for beginners and children doing French for a while. For the price I was disappointed that there are no photocopiable flashcards to go with the songs as there are in J'aime chanter. I will have to draw my own now!